This was a fun little project. 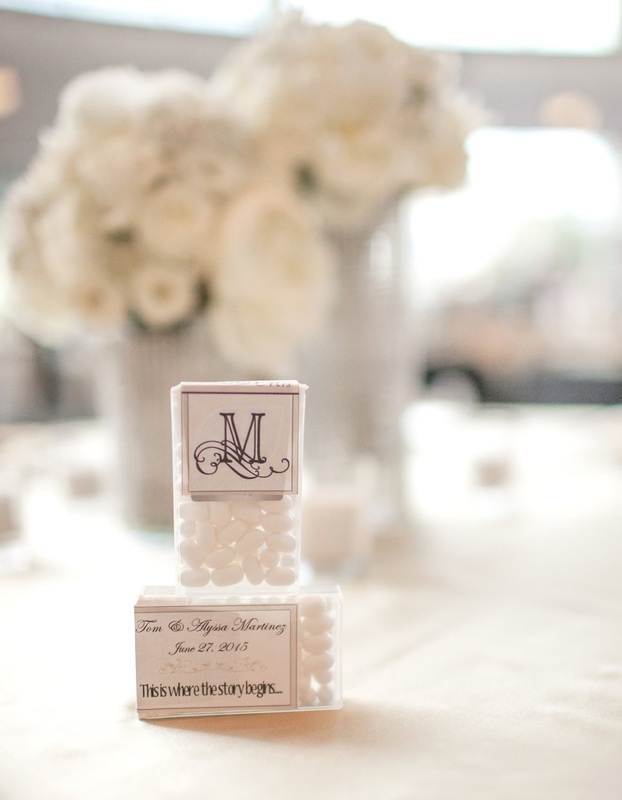 I had a bride contact me to design a tic tac label for her and her groom to use as favors for their upcoming wedding. 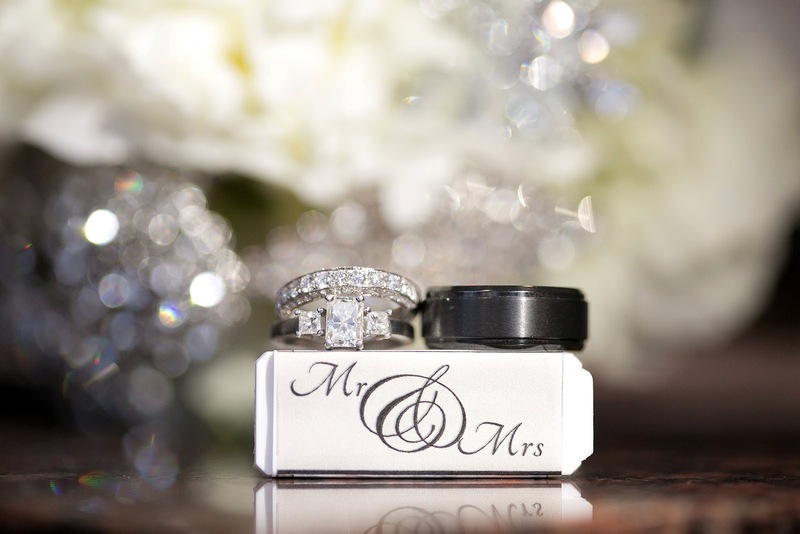 She admired another design that I had done and really liked the idea of customizing something for their day. Once the design was finalized, I printed them on sheets of white sticker paper. Alyssa and her Mom tag teamed the process of attaching them to the cases. 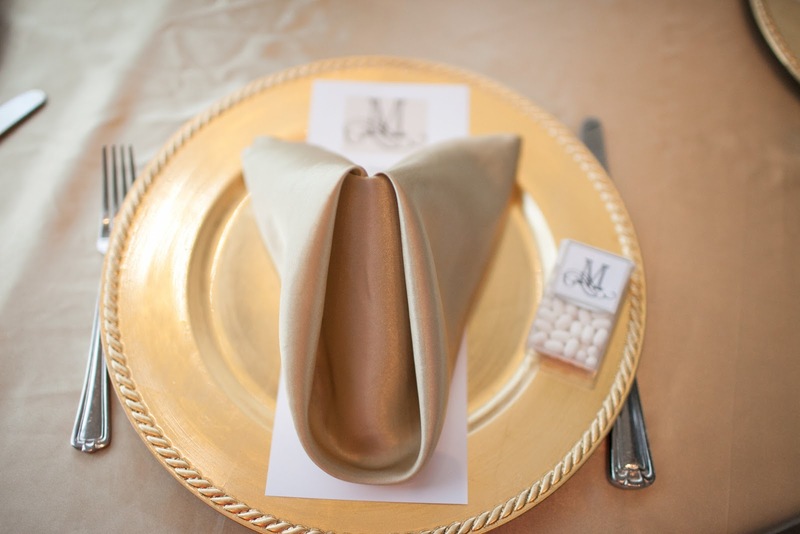 Their "M" monogram was used throughout the reception including the menus, programs and on a large video screen at the venue itself. 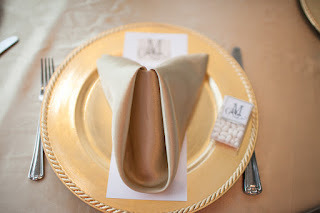 At the reception, a favor was placed at each of the place settings. Congratulations Mr. and Mrs. Martinez! As a general rule of thumb, I like my cookies soft. However, a flavorful biscotti with a cup of milk, tea or coffee and I can be equally happy! Serve that tea in a family heirloom cup and saucer set and I'm feeling like I could be sipping tea alongside Lady Mary at Downton Abbey. 2. In a mixing bowl, cream together the butter, shortening and sugar on medium speed until light and fluffy. Add the eggs one at a time, beating well after each addition, and stopping to scrape the sides and bottom of the bowl between additions. Beat in the vanilla extract, baking powder and salt. Reduce the mixer speed to low and gradually add the flour until incorporated. Add the chips and mix on low speed briefly to evenly distribute into the dough. 3. Turn out the dough to a lightly floured work surface. Divide the dough in two and shape each piece into a 12-inch log. Transfer the logs to the prepared baking sheet, with damp fingers, lightly flatten the logs to about 3" wide. 4. Bake for 20-25 minutes until the logs are lightly browned around the edges. Remove from the oven and let rest for 20 minutes. Reduce the oven temperature to 300 degrees. 5. Transfer the logs to a cutting board and using a serrated knife, slice them on the diagonal into 3/4" to 1" slices. Return the slices, cut side up to the baking sheet and bake for 15 minutes, then turn them over and bake an additional 15 minutes. Remove from the oven and allow to cool completely. 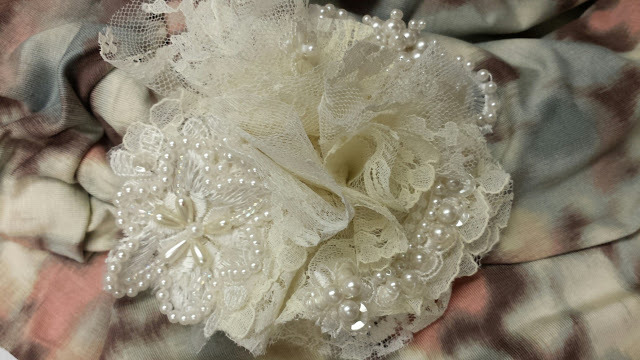 I so enjoy creating this type of item for a bride; whether it be a veil or hair comb, sash or garter. It's when the bride brings to me something from Mom, Dad, Grandpa or Grandma and asks me to make something that they can wear on their wedding day. 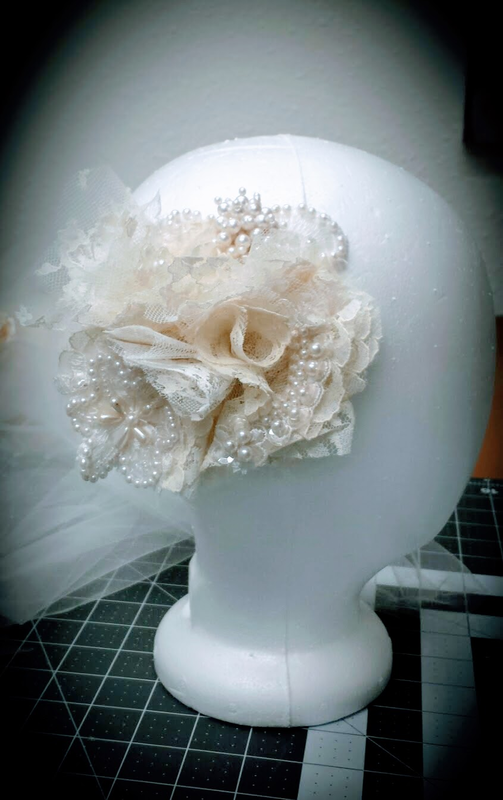 This particular bride brought to me Mom's wedding gown and veil and Grandma's detachable train and asked if I could make a hair accessory that she could wear at the reception. Aubrey was a delight to work with, it just took a bit of conversation for me to understand the size she wanted and if there were any unique pieces from any of the items that she absolutely wanted to have incorporated in her piece. After that, she left it up to my creative juices. Aubrey has very long, thick hair that she plans to wear in a side bun, so I chose to use an "alligator clip" on the back to attach it to her hair versus a simple comb. 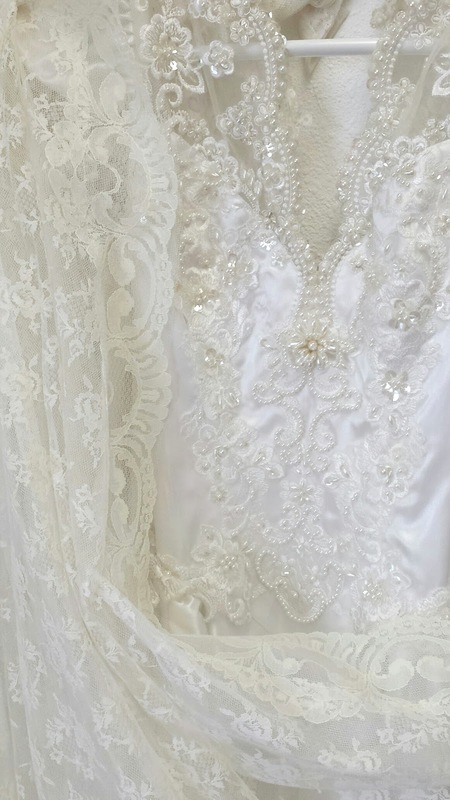 Her Mom's dress (circa the '90s) had a lot of embellishment on the bodice and sleeves; beautiful pearls and sequins, as did her headpiece. Grandma's train was an ivory chantilly lace. I chose to use Grandma's lace as the "building block" and then added the embellishments from Mom's items as I went. Aubrey picked up her hair clip this past week, and I'm happy to report she loved it! I'm positive this is going to look even better on Aubrey than it does on my styrofoam head! I like the simplicity of a crock pot recipe.....put it all together and let it cook for hours. The aromas throughout the house are heavenly and whether you're working or running errands on your days off, you know you'll have something yummy ready for dinner when the time comes. I don't know about you, but sometimes we find ourselves stuck in a rut eating the same things, so this was a nice change of pace! Thanks to Campbell's kitchen for the recipe. Stir the broth, preserves,onion and mustard in a slow cooker. Add the pork to the cooker, trimming the fat, if needed. Turn to coat. Cover and cook on LOW for 8-9 hours or until the pork is fork-tender. This recipe may also be cooked on HIGH for 4-5 hours. For thicker sauce, mix 2 Tbsp. cornstarch with 2 Tbsp. water in a small bowl until smooth. Remove the pork from the cooker. Stir the cornstarch mixture in the cooker. Cover and cook on HIGH for 10 minutes or until the mixture boils and thickens. *I used only one pork tenderloin in this recipe (1.5 lbs.) but used the same amount of ingredients so that I would have a lot of glaze. Also, I used a combination of apricot preserves and orange marmalade. I cooked it on low for 3 hours. 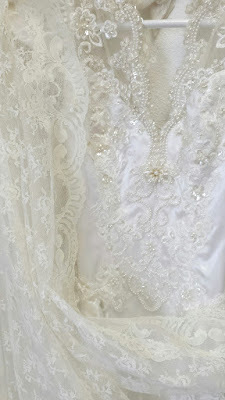 I fell in love with this fabric when I was walking through the bridal fabrics of my local JoAnn store. The ombre look of the tulle was so unique, that I circled back around after I found what I needed and had some cut; they had this version, and a blue/purple combination. I didn't really have anything specific in mind, I just knew I always wanted to make a long tulle skirt. 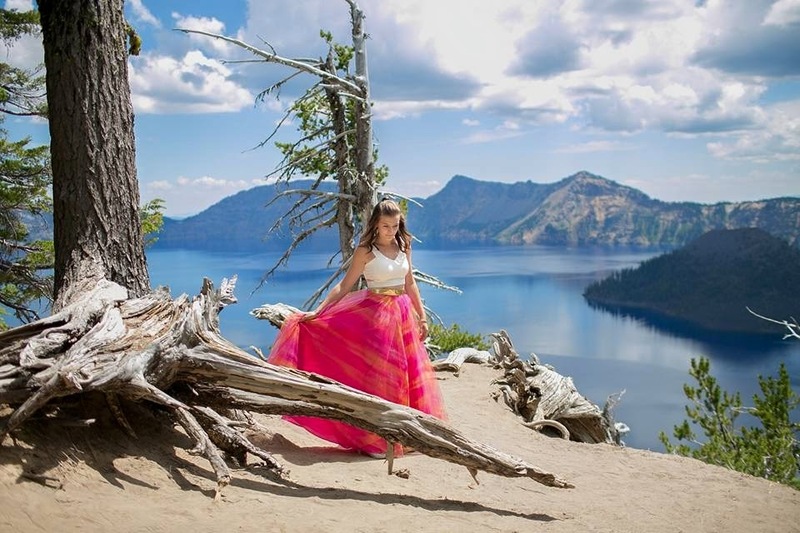 As it turned out, I offered to make a skirt for my daughter to wear for a shoot to celebrate the five year anniversary of her photography business. We decided since we would be in Oregon during the time of her anniversary that we should take advantage of the unique scenery. 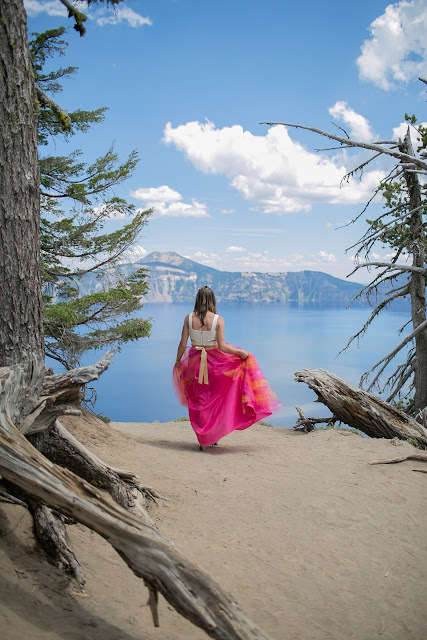 These shots were taken up at Crater Lake National Park. If you are unfamiliar with the park, there is some great history to the park, including the depth of the lake. When we first stopped and trekked up to the lookout, the view was absolutely breathtaking. In fact, it looked fake! Like the backdrop of a movie soundstage. This is definitely a must see if you're in the area. We didn't have much time that day to explore, since it was a 90 minute drive one-way from where we were staying in Sunriver, so it would be fun to return some day to spend more time in the park itself. We stopped at several lookouts along the way, but barely scratched the surface of the 33 mile drive around the rim of the crater. Not to mention the many hikes that can be taken, including at least one that goes down to the lake itself. As for the skirt, it is two pieces. The underskirt is made of a matching fuschia polyester lining fabric with tailored waistband and center back zipper. The tulle skirt ties on over the skirt and finishes with a bow at the back. I pictured a crop top to complete the look, and we were able to find just the right one online! Happy Anniversary Katie....you look beautiful and I'm so proud of you! This idea came to me when we were trying to put together a low-key bridal shower/celebration (for our son/daughter-in-law to be) at our family reunion in July. Something simple, but meaningful since a good portion of my husband's family was going to be at the reunion, but many would not be able to attend the wedding in August. So, in addition to a BBQ theme with a cake that my Mother-in-Law and I chose....I wanted to put together some shower favors. Something I could transport with me in my luggage and assemble once I got there. I wanted my daughter-in-law to participate in the celebration so I knew we needed to keep her gluten-free diet in mind. As I "googled", gluten free foods I came across a list that included nuts. Woo Hoo!!! and the rest is history as they say. I came up with the play on words and decided to use the burlap and lace theme from their invitations as part of the equation. I made the "nuts about each other" tags using my silhouette machine. I used a variety of fonts, some which I used on their wedding invitations and Save-the-Dates. For the favor bags, I landed on a 5 x 5 final size. So I began by cutting strips of burlap 5" wide by 10" in length. I also cut strips of lace trim in 5" strips. Once I had all my pieces cut, I went to town stitching the bags together. First I sewed the lace on; using a zig-zag stitch on both the top and bottom of the lace and then about 1/8" from the edge on both of the short ends to prevent fraying. Finally, I folded the bags in half wrong sides together and used a zig-zag stitch to stitch the sides together. I picked up plastic treat bags at Hobby Lobby so that I could portion out the nuts into them and then slide the plastic bags into the burlap. The bags come in bulk (100 bags) for $2.99. I also bought some gold twist ties (50 count) for $1.99. I knew I didn't want to place the nuts directly into the burlap bags since I was buying mixed nuts from Costco. I was able to transport the sewn bags, tags, plastic treat bags and twist ties in a gallon freezer bag. It flattened out really well so they didn't take up much room in my luggage. I bought the nuts when we reached Oregon. Once all of the bags were filled, I tied each of the bags with jute twine, slid one of the tags onto the twine and tied them in a bow. They looked really cute....and were an absolute hit with the family! In fact, many of them said they were looking forward to eating them on their flights home. This project really went together very easily. I had a total of 28 of them to make so it didn't take me too terribly long. These could be really fun as favors for a rustic chic wedding! To keep the cost down, you could used shelled peanuts or peanuts in the shell; both can be purchased in bulk.